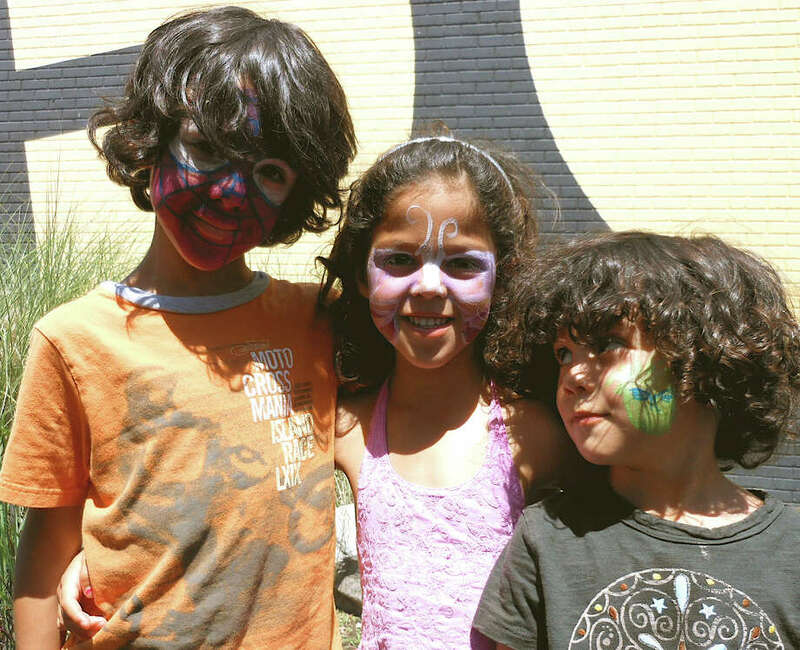 Paul, Lila and Emilio Reyes show off their painted faces at the Fairfield Theatre Comonay's Back Lot BBQ on Saturday. Enjoy a little music with your meal? How about more than a dozen upright drums and shakers all at the same time? An African Drum Circle was one of the attractions Saturday afternoon during the Fairfield Theatre Company's Back Lot BBQ, an event that marked the first year of music education offered by KEYS in Bridgeport. KEYS is an acronym for Kids Empowered By Your Support, an organization based at Talmadge Hill Church in New Canaan. The program was founded eight years ago by Rob Silvan. The nonprofit's mission is to bring private and group music instruction to school kids in Bridgeport that don't normally have access. The BBQ celebrated the partnership that FTC and KEYS have enjoyed since September 2011. KEYS uses FTC space on Saturdays for workshops in piano, cello, violin and guitar. Those attending the event included parents, teachers and students associated with KEYS, as well as FTC supporters. Besides the Drum Circle, led by Kojo Bey, director of sounds of for the Afrika drum and dance troupe, the event included a grilling station with hamburgers, hot dogs and pulled pork, ices, tours of the FTC and a highlight music performance by Ricardo Reyes and his Latin band, Cosmic Jibaros. "It's been proven that learning an instrument helps with focus, academics and social adjustment," said Julie Bostwick, KEYS' executive administrator. "Most of these kids can't afford private lessons. Bridgeport kids should all have the same opportunities as kids in surrounding towns. Some schools do have music programs, but they're very limited." Bostwick said that approximately 150 children are provided private lessons through the program and 300 are in group lessons.